Searching for the 2017 Toyota Yaris in Orange County? 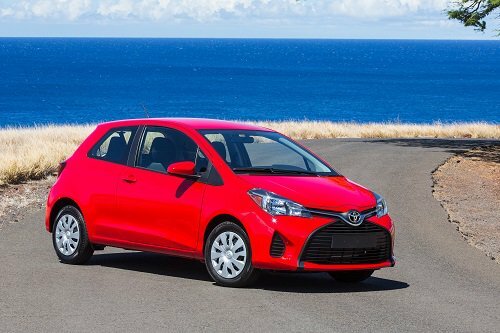 The 2017 Toyota Yaris is an affordable compact vehicle offering a large and comfortable interior, a large number of amenities and numerous safety features. New for 2017 is Toyota’s “Safety Sense C” package which includes active features such as lane departure warning, automatic braking and high beams. The base model is powered by a 1.5 I-4 engine with an output of 106 hp and 103 lb feet of torque. Trim levels include the L and LE. The Toyota Yaris is available as a 3-door and 5-door vehicle. Standard features include a stereo system, touch screen and blue tooth compatibility. Cargo space stands at 15.3 cubic feet for the two-door Toyota Yaris and 15.6 cubic feet for the four-door edition. A large number of safety features are included such as ABS, ESC, daytime running lights and child safety locks. Stop by our showroom and test drive the 2017 Toyota Yaris in Orange County, CA today.